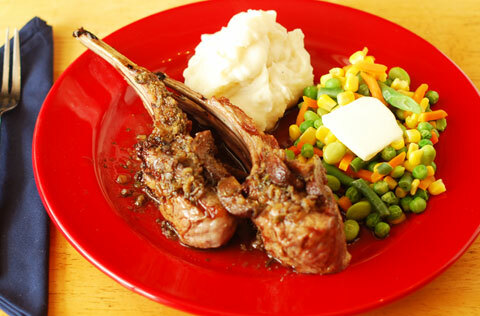 The lamb chops are cut from a rack of lamb and grilled to medium-rare perfection. The sauce is made with figs and sweetened with minced dates. Together, they make an excellent meal. The idea was inspired by a roast leg of lamb recipe. I liked the idea of rack of lamb better. If not already done, pluck the leaves from the thyme sprigs and the rosemary sprigs, discarding the stalks. Mince the rosemary and sage. Slice the figs and mince the dates. Divide the rack of lamb into chops of two ribs each. Trim off the excess fat and then season the meat with salt and pepper. Set aside. Pour the stock and bourbon into a large skillet and add the herbs, figs, dates, and garlic. Heat to boiling, lower the heat to medium-low and simmer to reduce the liquid by at least half. Taste and adjust for salt and pepper. Set aside. Heat a stove top grill and oil well. Place the chops on the grill. If you like to see well-defined bar marks on you chops, do not move them until it is time to turn them over. Cook, turning once, to an internal temperature of 125°F (52°C) for medium-rate, or to a higher temperature to the level doneness you prefer. Plate the chops with your favorite vegetables. Spoon fig sauce over the meat and serve.